Home sales in the US slumped in December 2018, while prices inched up slightly, marking the smallest annual increase since the end of the last housing crash in 2012, according to data from brokerage Redfin Tuesday, said Bloomberg. The median home price rose to US$289,800 in December, a gain of +1.2%, the slowest monthly pace since March 2012. Sales dropped by almost -11%, the biggest decline for any month since 2016, Redfin said. Previously hot metropolitan areas are cooling fast. Prices dropped -7.3% in San Jose, CA. 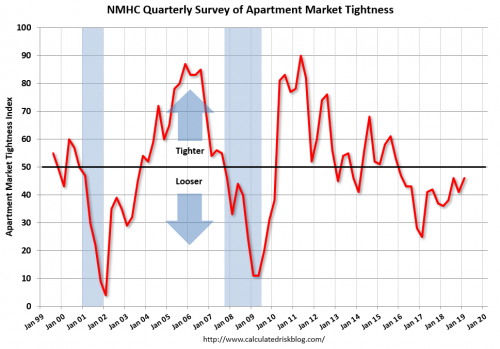 Also released Tuesday was the Case-Shiller US National Home Price Index, reported by S&P Dow Jones Indices, which rose at a seasonally adjusted annual growth rate of 5.1% in November, unchanged from the previous month, according to the National Association of Home Builders’ (NAHB) Eye on Housing. On a year-over-year basis, the Case-Shiller US National Home Price Index rose by 5.2% in November, down from the 5.3% rise in October. Home price appreciation in November reflects not only broader economic growth and tight inventory, but also affordability concerns, said NAHB. The US Home Price Index, released by the Federal Housing Finance Agency (FHFA), rose at a seasonally adjusted annual rate of 4.7% in November, slower than the 5.1% in October. 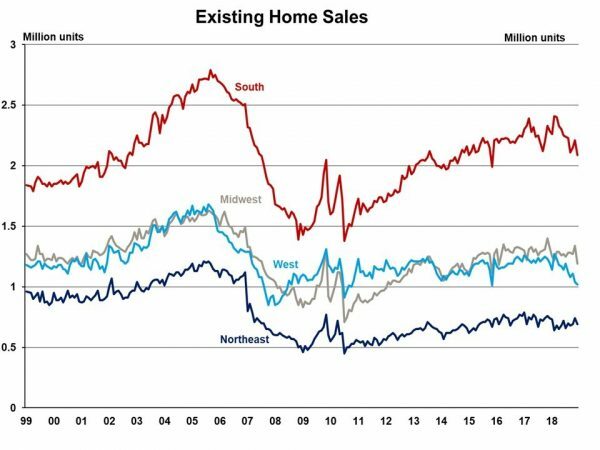 Elsewhere, total US existing-home sales, released by the National Association of Realtors January 22, decreased -6.4% to a seasonally adjusted rate of 4.99 million in December, after two consecutive months of increase, said NAHB Eye on Housing. Compared with a year ago, sales decreased -10.3% in December, the lowest level since November 2015. 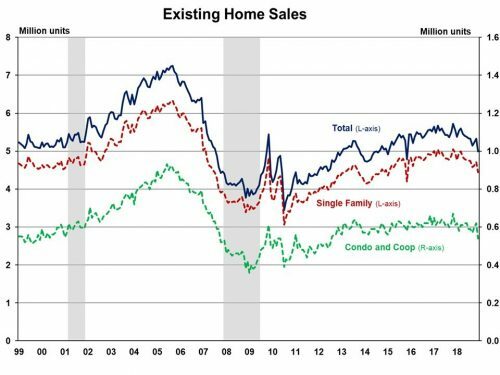 Total existing home sales include single-family homes, townhomes, condominiums, and co-ops. The median existing house price increased +2.9% from a year ago to US$253,600 in December. That was the smallest increase since February 2012. The first-time buyer share slightly declined to 32% from 33% last month but remained unchanged from a year ago. The December inventory decreased to 1.55 million units from 1.74 million units in November, but was up from 1.46 million units compared to a year ago. At the current sales rate, the December unsold inventory represents a 3.7-month supply, down from a 3.9-month supply last month and up from a 3.2-month supply a year ago. Houses for sale typically stayed on the market for 46 days in December, up from 42 days in November and 40 days a year ago. Some 39 per cent of homes sold in December were on the market for less than a month. The property market, which was surging for years as buyers fought for a limited supply of homes, is softening as inventories start to increase and buyers take more time, detailed Bloomberg. The jump in mortgage rates last year added to housing’s underlying affordability problem, putting an end to the era of rampant bidding wars. Looking ahead, this year, increases in US home prices will slow slightly, according to several real-estate research firms, including CoreLogic and Zillow Research, said the Columbus Dispatch January 13. CoreLogic projected an average price increase of +4.8% during the 12 months through November 2019. The average US home price rose +5.1% in the 12 months ending in November 2018, according to CoreLogic numbers. Rising home-mortgage rates are at the root of the slowdown, according to CoreLogic.